Once again Eureka (Masters of Cinema) brings us #196 in their unmissable classic film restorations. Laura is one of The American Film Institute’s 10 best mystery films of all time. Based on the book of the same name by Vera Caspary (Bedelia), Otto Preminger (Porgy and Bess, Anatomy of a Murder, Exodus, Rosebud) takes this excellent screenplay and delivers one of the best murder mysteries on celluloid. Also with Eureka’s Masters of Cinema range you get a plethora of special features, (see below). 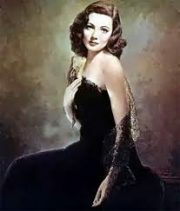 Laura starts with a monologue by one of the main characters, a Waldo Lydecker (Clifton Webb, The Razor’s Edge, Titanic) tells of his pain at the death of his friend and confidant Laura Hunt (Gene Tierney, Leave Her to Heaven, The Iron Curtain, The Egyptian). Waldo is a columnist and radio presenter with a lot of clout and he can make or break any reputation, which is very inconvenient for any potential suitor of Laura. Waldo enjoys recanting his tales of Laura until Det. Lt. Mark McPherson (Dana Andrews, Tobacco Road, Wing and a Prayer, Duel in the Jungle) enters to interview Waldo, who does all his writing from his bath tub. Waldo is a suspect in the murder investigation but he is so conceited he decides to help McPherson and introduces him to the other suspects, Laura’s fiancée Shelby Carpenter (Vincent Price, The Three Musketeers, Son of Sinbad, The Ten Commandments) and Ann Treadwell (Judith Anderson, Salome, Cat on a Hot Tin Roof, Star Trek III: The Search for Spock). Shelby is a free-loader and receives money from Laura and Ann who is also in love with Shelby as she believes they are kindred spirits. We find out how Laura and Waldo became platonic friends and what Waldo thought of everybody, but it is up to the Detective and you to solve the clues. Until the twist that is. 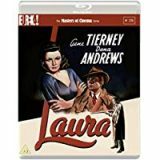 Laura is a masterfully crafted piece of writing and directing and is a must for any sleuths out there and with Eureka’s packaging it is so much more than just a black and white film.